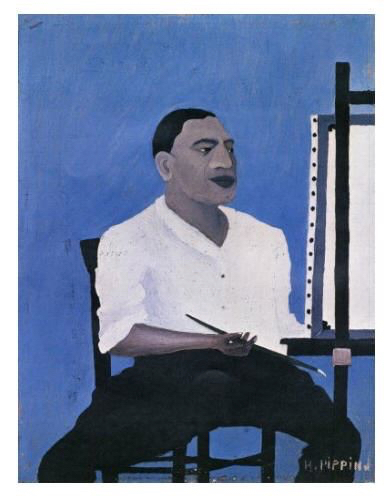 Art facilitator Christie Inocencio will help you capture the striking style of African-American folk art painter Horace Pippin at the Menlo Park Library on Feb. 11 from 6:30 to 8:30 pm. This adult program is free, but space is limited. Register online. Horace Pippin was an esteemed artist known for his renderings of the African-American experience, as well as biblical and historical imagery. Born on February 22, 1888, in West Chester, Pennsylvania, Pippin created art as a child, though he lost the use of his drawing arm in World War I. He persevered and taught himself to paint with his injury. Christie Inocencio is a teaching artist who leads programs at libraries, senior centers, schools, and other locations throughout San Mateo and Alameda counties and beyond. She started her company, Christie’s Creative Cupboard, in order to fill a need in the community for fun, educational programs for all age groups. This free program is made possible thanks to funding from the Friends of the Menlo Park Library.